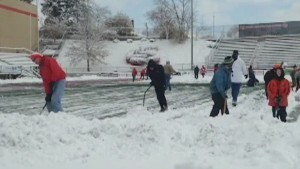 NEW: Stranded basketball team's coach: "It got really bad really fast"
(CNN) -- Buffalo, New York, is no stranger to cold weather, but Tuesday's lake-effect storm and its upwards of 6 feet of snow was staggering for the city. "This storm is basically a knife that went right through the heart of Erie County," said Erie County Executive Mark Poloncarz. "I can't remember and I don't think anyone else can remember this much snow falling in this short a period." Some places have already seen more than 60 inches of snow. And there's more coming -- possibly more than 90 inches in some areas after another round of wintry weather hits at the end of the week. The equivalent of a year's worth of snow is going to pound some areas over a three-day period, Poloncarz said. "This is a very, very serious situation. This is a very serious storm ... 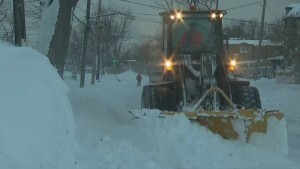 It's probably heavier than anything that we have seen in over 40 years, so it's going to take some time to dig out," Buffalo Mayor Byron Brown told reporters. "She was born, she's safe and she's healthy," Whitfield said. Firefighters reached the man about 8:30 a.m. Tuesday, the station reported. 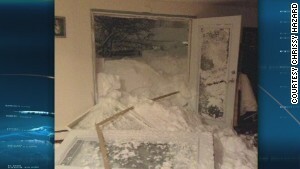 An ambulance couldn't reach the home, and a front loader that attempted to reach his home was stranded in the snow. And it's not over: Another surge of cold air is likely by Wednesday to Thursday in the Midwest and Northeast. The Southeast could see record lows Wednesday morning as temperatures drop into the teens and 20s. "The steam from the lake ... (is) still much warmer than the air," he said. "The air is in the teens and the water in the 40s. That steam comes up and wants to rise. That rise ... creates a thunder storm but it's so cold it doesn't rain. It just snows." Snow totals could approach 70 inches south of Buffalo -- almost 6 feet of snow. 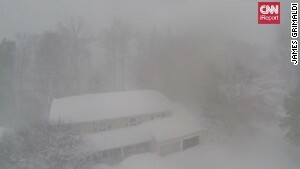 Lancaster, New York, has already received over 40 inches of snow, and it continues to snow at 4 to 5 inches per hour. 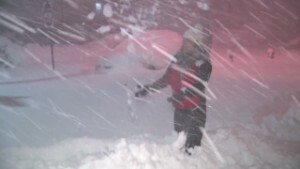 Some areas in Erie County, Pennsylvania, have already seen 3 feet of snow. Thunder and lightning have been reported. Some roadways already had turned into parking lots of abandoned vehicles and stranded motorists, WKBW reported. A bus carrying 24 members of the Niagara University Women's Basketball team returning home from a game in Pittsburgh was stuck on a highway because of the snow. In an interview via Skype with CNN's Don Lemon Tuesday night, team members said they'd been stranded for 24 hours. "The roads weren't plowed. It got really bad really fast. I'm assuming that somebody in the front of the line got stuck and everybody else had to stop, and that's how we got where we are," head coach Kendra Faustin said. For hours, she said, the snow was coming down so hard that they couldn't see anything surrounding the bus. Now, Faustin estimates there are more than 100 cars trapped on the highway behind them. They're running short on food and water and still waiting for rescuers, she said. "It seems to be getting better, is what we're hoping," she said, "but more importantly we're just hoping to get on the move." Team members described their predicament throughout the day on Twitter. One post from the team's assistant coach showed police approaching the stranded bus on a snowmobile. To make matters worse, this is only the first band of heavy snow in the Buffalo region. More snow is expected on Wednesday, and then the lake-effect snow bands set up again for Wednesday night into Thursday with very heavy snow likely again. This could rank high in the history of lake-effect snow events. Over half the country -- 50.2% -- had snow on the ground Tuesday morning, according to the National Weather Service. Cuomo also announced that the Metropolitan Transportation Authority, which operates the nation's largest public transit system, has activated NYC Transit's 2014-2015 winter operations plan in anticipation of the snow season. The plan includes new snow-fighting equipment for the department's buses, new improved cold-weather and communications equipment, and increased planning and collaboration with the Department of Sanitation, Cuomo said in a statement. CNN's Daniel Verello, Kevin Dotson, Chuck Johnston, Martin Savidge and Catherine E. Shoichet contributed to this report. Winter is the season to come down with awful, sniffling, sneezing, muscle-achy colds. 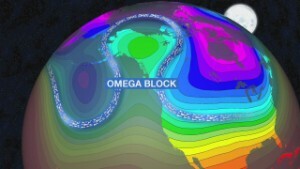 We know cold weather has something to do with this. Or do we? What is phone freeze? Smartphones are not built for the extreme cold. Learn how to use your device this winter. Do your muscles hurt more when it's cold outside? Cold weather causes muscles to lose more heat and contract, causing tightness throughout the body. There are some true life-threatening scenarios that can happen when the winter weather takes over. Here are some suggestions to help you stay safe. When winter hits, we all have to make a few concessions when it comes to taking care of our skin. Here are three strategies to try. Power outages can be scary if you aren't prepared. Consider our tips to stay healthy when the lights go out. Here are some tips to ease the trip home if you get caught traveling during a winter weather storm.